Built as a rental house ~1901, this house was owner-occupied by the Franklin family for 50 years. What? No trapezoidal roof in the restoration, Gary? Actually, I like this look better anyway. Any interior shots? - 507 Yancey was built on land that once 'belonged' to 602 South Duke (i.e. the large parcel was subdivided into 4 smaller parcels.) of these 4 houses, 602 and 604 South Duke are gone, while 505 Yancey and 507 Yancey remain. But 507 is in its original form - I actually love the weird trapezoidal roof that 602 South Duke had - I definitely would have restored it! 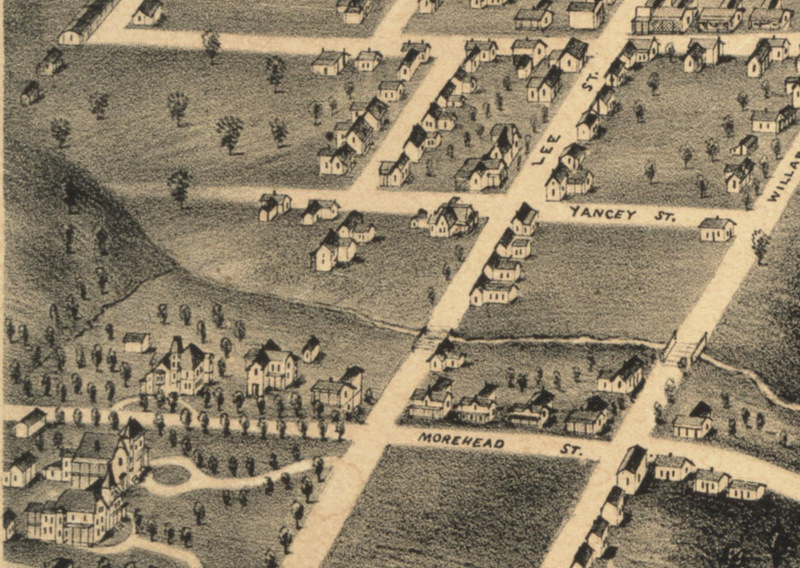 Any idea where Yancey street got its name? Must have been Yanceys that lived on that street? Does anyone know which Yanceys and what house? Is there a Yancey house still standing? I've never found a record of Yanceys living on the street. James Blackwell seems to have been the first resident on the street, and WG Vickers and BL Duke owned most of the land. My guess was that it was named after a person unrelated to the street - perhaps Bartlett Yancey, for whom Yancey County is named. I noticed the porch (prior to restoration) had a light blue ceiling. I hope it was retained. In the south, the blue ceiling on porches and blue on window trim keeps away bad spirits. No joke! Sherwin-Williams (on their website) agrees with you -and me: "Once just an old Southern tradition, the blue porch ceiling has made its way north and is being introduced to new generations. There are numerous theories as to why – from fooling spiders and wasps into thinking the ceiling is the sky, to blue being a harbinger of good luck, to the color extending daylight, to scaring away evil spirits." Perhaps instead of choosing the anti-mosquito blue, you chose the anti-bad spirit blue. That sounds like pretty good news to me. Durhamite - I can't say that I retained the exact blue that was on the ceiling of the front porch - it was kind of a robin's egg blue that was pretty intense, but I did repaint the ceiling of the front porch a light(er) blue. The story I heard growing up was that the blue ceiling was supposed to keep away the mosquitoes, with the further explanation that it confused them as to where the sky actually was. I'm not sure it that was the New Orleans version or not, although New Orleanians are usually not shy about invoking more mysterious causes and effects. I can attest that it does not function as a mosquito repellent at all. I moved into 607 Yancey in October 1972, with my girlfriend and her sister. They already lived there. 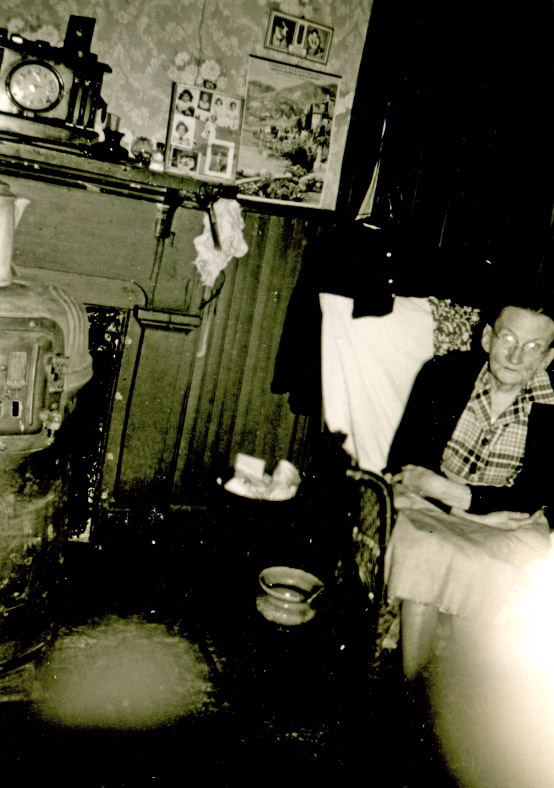 Winston Moore was their landlord, and we became friends. I did not have a job at that time, and I fell into helping Winston around his properties, mowing grass and the like. To pick up a little spending money. I helped him install the drywall in 507 Yancey, in the room with the large fireplace, shown in the photos of the remodeling.Winston was trying to teach me how to drive the nails in and just "dimple" the nailhead below the surface of the sheetrock. So it could be filled in to cover the nailhead with drywall "mud." Well, I did not do so well, so I discovered that carpentry was probably not my calling. Winston was a good friend, he helped me get my first car. He loaned me the money, and I paid him back at $25 a week until I paid back the $350. He had no reason to trust me, but he took a chance, and I was not going to let him, or myself, down. He told me WWII stories, he was in Italy, he showed me a Italian military rifle he had brought home from the war.. It was like the one used to assassinate President Kennedy. A Mannlicher-Carcano. The light blue ceilings on porches also kept mud dauber wasps from building nests on the ceilings. I guess their little wasp brains thought it was the sky ???!!! 507 Yancey was built in 1901 on land that originally 'belonged' to 602 South Duke Street, the James W. Blackwell house. 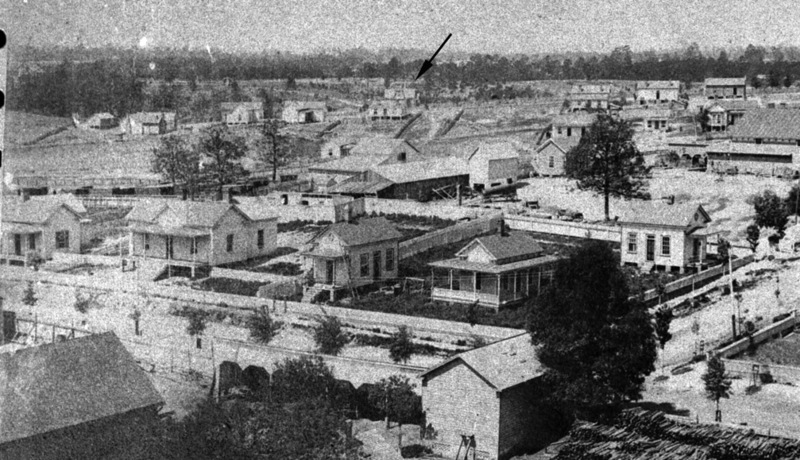 An early photograph, taken sometime in the 1880s from Blackwell's Durham Tobacco Co. (later the American Tobacco complex, looking west, shows the house sitting at the edge of the developed area southwest of the center of town. Looking southwest, 1880s. I've noted 602 South Duke with an arrow. 507 Yancey was later built on the empty land behind it. Blackwell had a number of careers, including work with the tobacco company, head of the Builder's Manufacturer's Supply Co., and a cashier for the Durham Water Company. He also bought and sold real estate, and later lived at 701 Jackson St. after selling 602 South Duke in the 1890s. In 1901, the house was owned for a time by HN Snow, who subdivided the large lot that the house was on, building 505 Yancey, 507 Yancey, and 604 S. Duke on the original lot. 505 and 507 Yancey built as similar, triple-A roofline cottages, hall-and-parlor style, with a two room wing extending back from one of the rooms. The center hall exited onto a rear porch that extended the length of the wing, and provided access to those rooms to maximize bedroom space. The house was rented to a series of tenants over its first ~17 years. 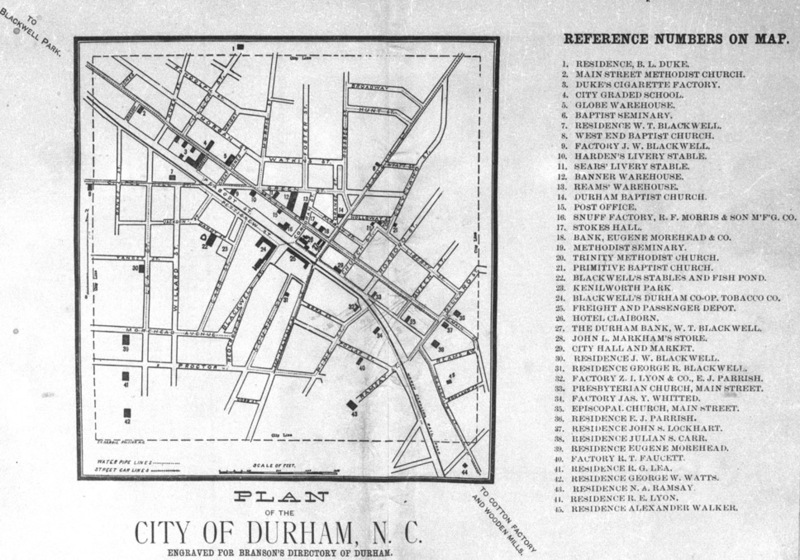 On March 6, 1918, 505 and 507 Yancey were sold to Durham Realty and Insurance Company. On June 18, 1918 DR&I resold the property to Liggett and Myers (with 505, as a single parcel.) Liggett evidently rented out the houses - I assume to their employees. However, just 3 years later, Liggett decided to dispose of the various properties they had purchased in 1918. They sold the properties to First National Trust in February 1921. First National Trust divided 505 and 507 into individual houses/lots. On October 14, 1921, 507 Yancey was conveyed to Minnie Beck Franklin. Franklin and her husband Otho lived in the house for 30 years; Otho was a tool grinder, Minnie worked at Liggett and Myers. On June 30, 1951, Minnie conveyed the property to her daughter, Nora. Nora worked at the Durham Laundry Company. The southern (lower) of the two areas outlined in red is the small residential pocket containing 507 Yancey Street. The former connection with the neighborhood to the west is still apparent . On October 1, 1971, Nora conveyed the property to WInston Moore not long before her death, ending 50 years of Franklin family owner-occupancy at 507 Yancey. Moore removed almost everything interesting from the house in turning it into a duplex. 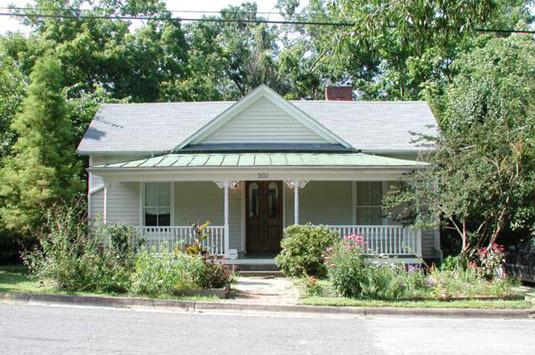 The two 24" doors were removed, most of the front porch was enclosed, windows replaced, etc. The house was rented as a duplex for 12 years. In 1983 tenants William and Katherine Pfieffer purchased the house. They added a rear addition in 1989. In 1997, the house was purchased by Gary Kueber. In 2003, Kueber won a Pyne Preservation Award from Preservation Durham for his restoration of the house. 12.05.2015 - Kueber's last day in the house - semi-recreation of the May 1997 picture, 19 years later. In 2016, Gary moved this house to 803 Vickers Avenue. Read the rest of this house's story here: 803 Vickers Avenue.